I hope this is the case with my Pro Micro as well. I double-checked everything, including pull-ups, but no life from the board. I ordered a couple of new pro micros, so we'll see. HOW are the transparent top key caps separated from the bottom keycaps? 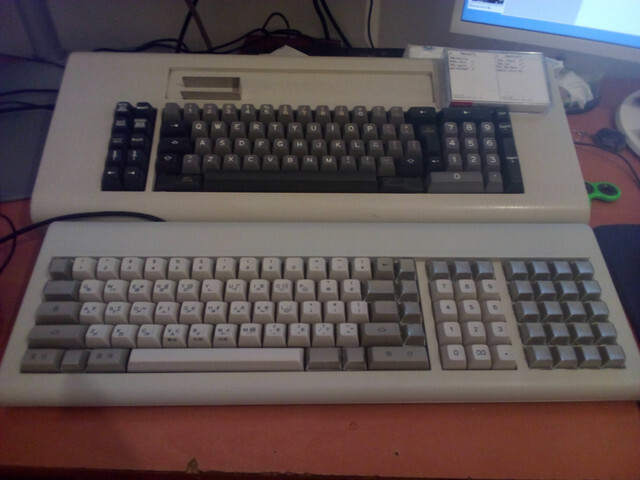 I tried to do it this weekend on my Pingmaster, so I could put small squares of paper with legends, like it was done in the quoted picture, but could not do it (and it's not like I can't separate the keycaps from the key stems on my Model M keyboards). I had to stop trying, as I became afraid of damaging either part of the few keycaps I had intended to fill out. It SHOULD be easy to do it, but I can't figure out how?! depletedvespene wrote: ↑ HOW are the transparent top key caps separated from the bottom keycaps? You are definitely not an idiot. Or we both are. If you got one of the NIB boards, there should've been a weird-looking metal keycap puller in there. With the caps still on the stems, slide the puller so that the notches are under the left and right sides of the cap. Then jiggle left and right while pulling up. Definitely seems to be a technique to it! I've got a couple of extra of those pullers. Let me know if you need one. Or you might be able to make something. The key is that the left and right sides of the cap need to be pulled outward from the center while lifting up. It won't work with Soarer's (either converter or controller). It works with hasu's 4704 converter. alh84001 wrote: ↑ It won't work with Soarer's (either converter or controller). It works with hasu's 4704 converter. It is cheapest directly from his online store, I think. You... seriously don't know about hasu's TMK adapter? yes , but i did not know there was one for the DB 9 connector . ok i got one , and i am just messing arround with the layout. Its a bit of a pain i have to flash the firmware to do this i much prefer the tipro sollution where i can reprogram a key on the fly whenever i want to, anway. Not all scancodes are listed in the layout editor , or i could not find them. Is there any way to just tell the layout editor what scancode i want to send rarther than having to chose it from the dropdown? I just did this last week What I did instead was convert the serial output to USB with a pro micro(I used TMK). I put the pro-micro inside the serial connector, and kept the original cord. Never needed to even open it up. I've just spent a *lot* of time trying to get this to work. As it turns out on my cheap Chinese arduino micro clone (which is otherwise great, BTW, since it fits inside a DB9 plug) the *only* pin configuration that works (and yes, I know you have to change the values in config.h if you want to use different pins) is CLOCK on PD1 and DATA on PD0. Everything else produces either no input at all from the keyboard (converter boots up fine, though and speaker beeps) or error messages. Glad you got it working. I am sure your troubleshooting will help others with similar problems in the future. I used those pins(which are the default) anyway, so I never had to address those problems. Hasu just replied to my bug report on github - apparently if you want to use different pins you have to change the interrupts at the bottom of config.h as well. If I can find out how exactly (i.e. which values for which pins) I might set up a pull request with updated documentation. It seems my attempts to use D11 for CLOCK were doomed from the start . ok, I've been reading this thread, and want to make sure I have my steps in order. thanks everyone for all the time and resources you've all put into this. I'm rubbish at hardware hacking, so apologies for my simplistic understanding here. edit: formatting, and for context, I have the 6341739 Chinese model. tobydeemer wrote: ↑ ok, I've been reading this thread, and want to make sure I have my steps in order. update: yes, it's that simple. I am typing on it right now, and it's freakin' awesome. So I'm the owner of a nos pingmaster. Using OldIsNew's guide, I wired up a pro micro to a db9 breakout and flashed it with the stock layout. I don't know why, but there's no keyboard in the device admin and no keypresses are being registered. I don't know why tbh, maybe an issue when programming? It could be a million things. Faulty wiring sounds probable, as a failed flash usually tells you it failed. Hi guys finally i take the chance and got my hands on a pingmaster the Japanese one was out so i take the Chinese variant. First thing i learned is NEVER USE ALCOHOL TO CLEAN THIS KEYBOARD ! i used it to clean a small dirt in the bottom and the paint melted !. Lucky i discovered this in the bottom. Loaded a firmware flashed by an user in the first or second page of the thread and works great on the first try. My problem is how the TMK keymap editor is used ?. If i download the .hex and flash it in the teensy this will not work the keyboard will do nothing. I have seen people compiling stuff can someone tell me how this is done ?. Really nice job! I'm looking forward to how you'll get this finished. 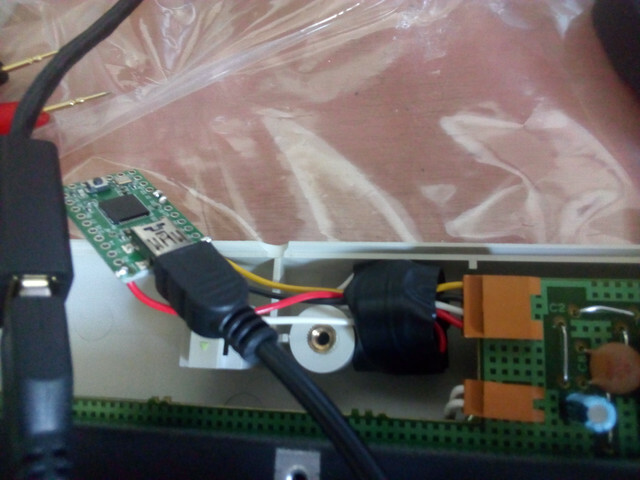 soviet9922 wrote: ↑ Loaded a firmware flashed by an user in the first or second page of the thread and works great on the first try. Thanks for the information i'm looking at the list on the "base firmware" option in the TMK page you linked. But theres no such option for ATMega32u4 where it is on the webpage ?. soviet9922 wrote: ↑ Thanks for the information i'm looking at the list on the "base firmware" option in the TMK page you linked. So anywhere where the website says "IBM4704 Rev.1" the resulting firmware should be compatible with your ATMega32u4 based teensy/clone. Thanks for the reply swampangel i was able to get my keyboard working now, and do a custom layout. I was just confusing the revision option on the tmk editor. i got the adapter installed in the case and do a small hole on the bottom to reset the teensy. I received one of these yesterday. Not that suprised that the shipping costs to Europe were so high, as it somehow managed to cross the Atlantic three times (!) on its way from from USA to Finland. Bound to expensive with that mileage. Just a snippet from the shipping updates: Chicago, USA --> Cologne, Germany -->New York, USA -->Stockholm, Sweden, which is one helluva trippy delivery route. Anyway, I managed to get it working thanks to this great thread. My only problem is that beeper keeps making this humming sound, even when it is dialed all the way down. It is barely audible, but at quiet night time it comes really annoying. Anyone know what would be easiest and least intrusive way turn the beeper off completly? 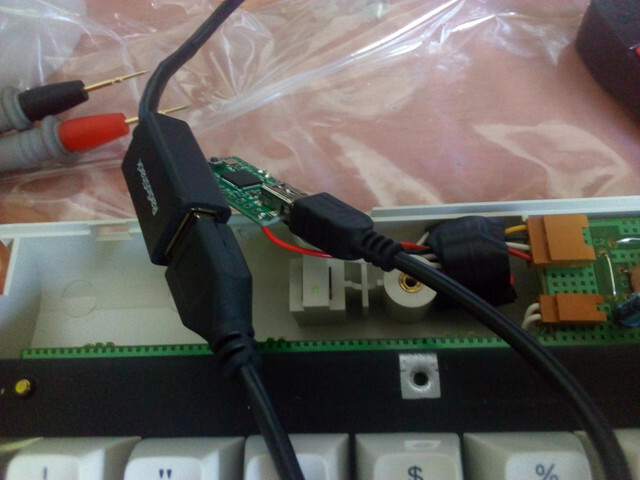 I'm using the original IBM connector hooked up to a DB9 female connector, which is in turn wired into Teensy 2.